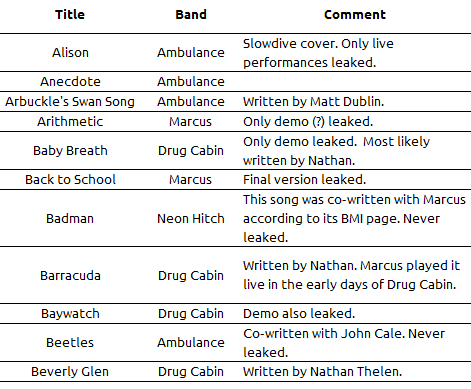 I've wanted to write a list of songs for some time now, and since there are some new ones added to Marcus' catalog, I decided to finally do it. It's a bit messy, however, since I can't find a way to sort it correctly. So who can confirm if this is actually "Upsetter" or the other "Marcus Congleton" tune? Can't wait to hear more! Here it is, the first fully (?) recorded Drug Cabin concert. I don't want to spoil you the setlist so go watch it, RIGHT NOW! Thanks a lot to the uploader! There's an article featuring Drug Cabin on the new LARecord. There's an online version of the magazine here, although it hasn't been updated yet. Better keep an eye on it!. New demos uploaded to the Soundcloud page. Totally spoiled. Will make a complete list of all the demos later.